The two forms of pulp therapy for children’s teeth are: vital pulp therapy for primary teeth (pulpotomy) and non-vital pulp therapy for primary teeth (pulpectomy). Vital pulp therapy is for cases in which the tooth’s pulp may be salvaged. 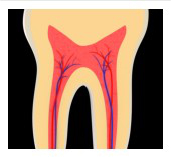 The main purpose is to maintain and protect existing healthy pulp by removing the diseased pulp tissue within the crown portion of the tooth. Next, an agent is placed to prevent bacterial growth and to calm the remaining nerve tissue. diseased pulp tissue is completely removed from all parts of the tooth. tooth to fall out and be replaced by a permanent tooth. ask if space maintainers are necessary for future development. If you suspect your child is in need of pulp therapy or any questions, Please contact Dr. Cima Mazar-Atabaki’s office in ALISO VIEJO to schedule an appointment for a consultation today.